Info Travertine - How is it Formed? Travertine marble, pronounced TRAV uhr teen, is a dense, closely compacted form of limestonefound mostly in banded layers. Most travertine is white or cream colored. It consists mainly of calcium carbonate. It forms when calcium carbonate separates from water through evaporation. Travertine is often used as decorative building stone because it is easy to cut. Travertine occurs in areas where limestone is common and where circulating ground water contains calcium carbonate. It often forms around the mouths of hot springs and in streams. Rock formations called stalactites and stalagmites, which are found in caves, consist primarily of travertine. Calcium-carbonate-encrusted, yet growing moss, early stage of petrified "Calcareous Tuff"
When carbon dioxide-rich water percolates through rocks in limestone areas, the water dissolves the limestone (typical karst process) and becomes saturated with it. When the environment the water runs through changes significantly (e.g. drop in pressure and/or change in temperature) this causes the water to release the carbon dioxide as gas, much like fizzy drinks. 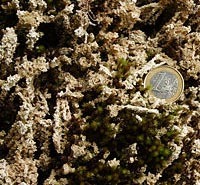 The calcium carbonate then recrystallizes; small debris, scrub and living biotic material such as moss, algae, and cyanobacteria are encrusted. The biotic material may survive and continue growing on top. Rich deposits of aged, dried and hardened travertine have already been mined by the Romans. The rock typically remains quite porous, with numerous cavities. When exceptionally porous it is known as "Calcareous Tuff" (German: Kalktuff). When pure and fine, travertine is white, but often is brown to yellow due to impurities (other than carbonate minerals). Extensive deposits exist at Tivoli, Italy, near Rome. In fact, travertine derives its name from this town. Tivoli was known as Tibur in ancient Roman times. The ancient name for the stone was lapis tiburtinus meaning tibur stone, which has been corrupted to travertine. Travertine has formed 16 huge, natural dams in a valley in Croatia known as Plitvice Lakes National Park. The travertine clings to moss and rocks in the water, and has built up over several millennia to form waterfalls up to 70 m in height. Other beautiful cascades of natural lakes formed behind travertine dams can be seen in Band-i-Amir (Afghanistan), HuangLong Valley (Sichuan, China), Semuc Champey (Guatemala), and Pamukkale (Turkey). Many geyser fields also have colorful travertine deposits. The largest building in the world constructed largely of travertine is the Colosseum in Rome. Other notable buildings using travertine extensively include the Sacré-Cœur Basilica in Paris and the Getty Center in Los Angeles, California. The travertine used in the construction was imported from Tivoli. The website of the Getty Center contains more information about the use of travertine in its construction, including some videos of travertine being quarried and cut for use. The stone is most widely used in Italy, Greece and Turkey. Travertine is one of the most frequently used stones in modern architecture, and is commonly seen as façade material, wall cladding, and flooring. Architect Welton Becket was one of the most frequent users of travertine, incorporating it extensively into many if not most of his projects. 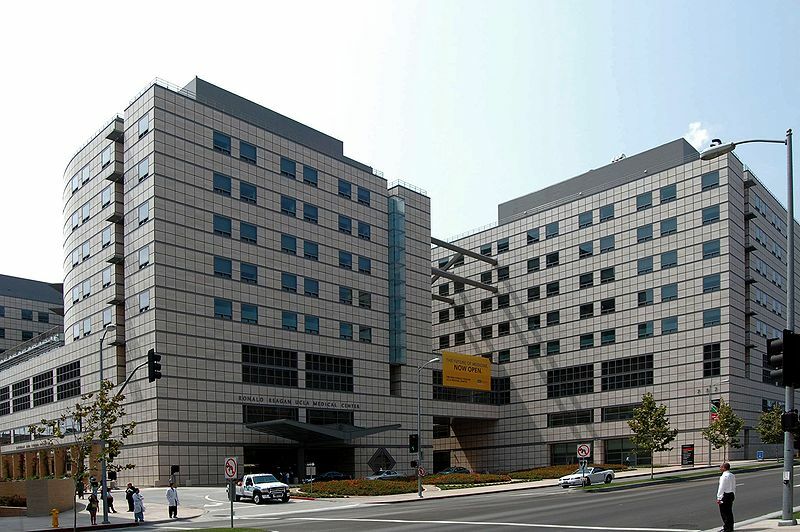 The entire first floor of the Becket-designed UCLA Medical Center has thick travertine walls. There are two or three small travertine producers in the western United States. U.S. demand for travertine is about 0.85 million tonnes, almost all of it imported. Most of the imports come from Turkey, Mexico is next, then Italy, and then Peru. 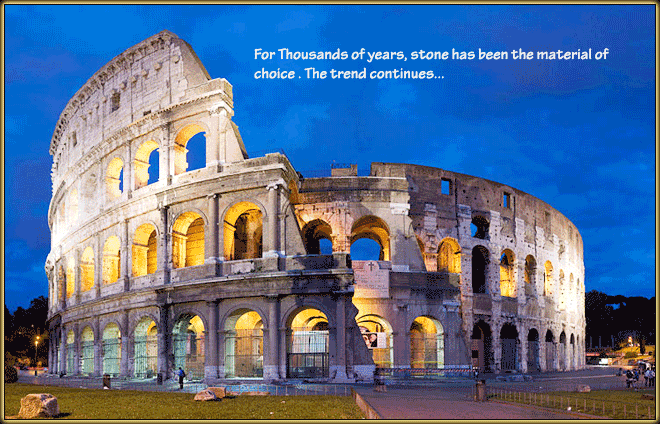 A decade ago, Italy had a near monopoly on the world travertine market. Folk, R. L., et al; (1985) Bizarre forms of depositional and diagenetic calcite in hot spring travertines, in Carbonate Cements; SEPM Special Pub. 36.